The CBI observed the cosmic microwave background, a snapshot of the universe at 300,000 years old. 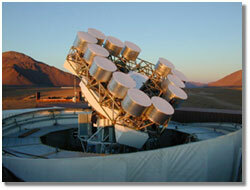 The CBI consists of 13 radio antennas located on a plateau at 5,080 meters (16,700 feet) in Chile's Atacama Desert. 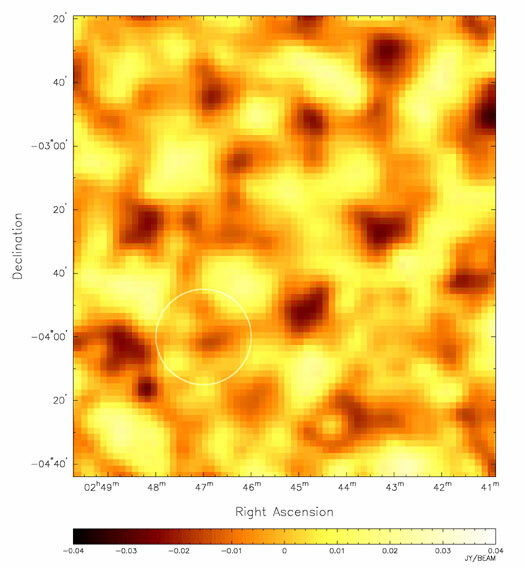 Astronomers operating from a remote plateau in the Chilean desert have produced the most detailed images ever made of the oldest light emitted by the universe, providing independent confirmation of controversial theories about the origin of matter and energy. Pushing the limits of available technology, the Cosmic Background Imager (CBI) funded by the National Science Foundation (NSF) and California Institute of Technology (Caltech) detected minute variations in the cosmic microwave background, the radiation that has traveled to Earth over almost 14 billion years. A map of the fluctuations shows the first tentative seeds of matter and energy that would later evolve into clusters of hundreds of galaxies. The measurements also provide independent evidence for the long-debated theory of inflation, which states that the universe underwent a violent expansion in its first micro-moments. After about 300,000 years it cooled enough to allow the seeds of matter to form and became "transparent," allowing light to pass through. CBI observed remnants of that early radiation. The data are also helping scientists learn more about the repulsive force called "dark energy" that appears to defy gravity and force the universe to accelerate at an ever-increasing pace. "This is basic research at its finest and most exciting," said NSF Director Rita Colwell. "Each new image of the early universe refines our model of how it all began. Just as the universe grows and spreads, humankind's knowledge of our own origins continues to expand, thanks to the technical expertise and patient persistence of scientists such as these." "We have seen, for the first time, the seeds that gave rise to clusters of galaxies, thus putting theories of galaxy formation on a firm observational footing," said team leader Anthony Readhead of Caltech. 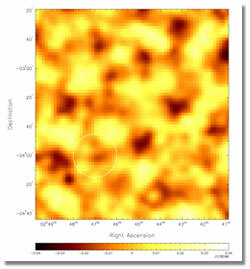 "These unique high-resolution observations provide a new set of critical tests of cosmology, and provide new and independent evidence that the universe is flat and is dominated by dark matter and dark energy." Readhead, with Caltech colleagues Steve Padin and Timothy Pearson and others from Canada, Chile and the United States, generated the finest measurements to date of the cosmic microwave background. Cosmic microwave background (CMB) is a record of the first photons that escaped from the rapidly cooling, coalescing universe about 300,000 years after the cosmic explosion known as the Big Bang that is commonly believed to have given birth to the universe. Data from the CBI on temperature distributions in the CMB support a modification of the Big Bang theory; that modification is called inflation theory. Inflation states that the hot plasma of the initial universe underwent an extreme and rapid expansion in its first 10 -32 second. The variations in temperature measured by the CBI are as small as 10 millionths of a degree. By plotting the peaks of temperature distribution, the scientists showed that the precise CBI data are entirely consistent with inflation and confirm earlier findings by other scientists. In April 2000, an international team of cosmologists led by Caltech's Andrew Lange announced the first compelling evidence that the universe is flat-that is, its geometry is such that parallel lines will neither converge or diverge. Lange's team observed at a different frequency from CBI, using a high-altitude balloon flown over Antarctica. Since then, two other teams -- using independent methods -- have revealed their analyses of the very faint variations in temperature among the cosmic microwaves. The four instruments have conducted precise measurements of parameters that cosmologists have long used to describe the early universe. Each set of data has offered new clues to the form of the embryonic plasma and has drawn scientists closer to definitive answers. NSF has supported the work of all four teams and their instruments, some of them for more than 15 years. Five papers on the CBI data were submitted today to the Astrophysical Journal for publication. 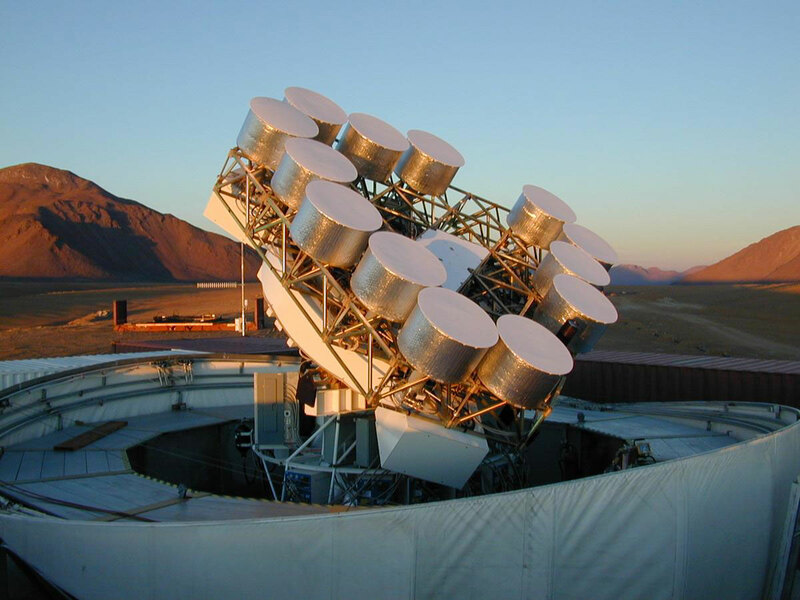 The CBI consists of 13 interferometers mounted on a 6-meter-diameter platform, operating at frequencies from 26 GHz to 36 GHz. Located in the driest desert in the world -- the Atacama -- CBI takes advantage of the low humidity at an altitude of 5,080 meters (16,700 feet). NSF has supported the CBI research since 1995. The National Council of Science and Technology of Chile provided the CBI site.